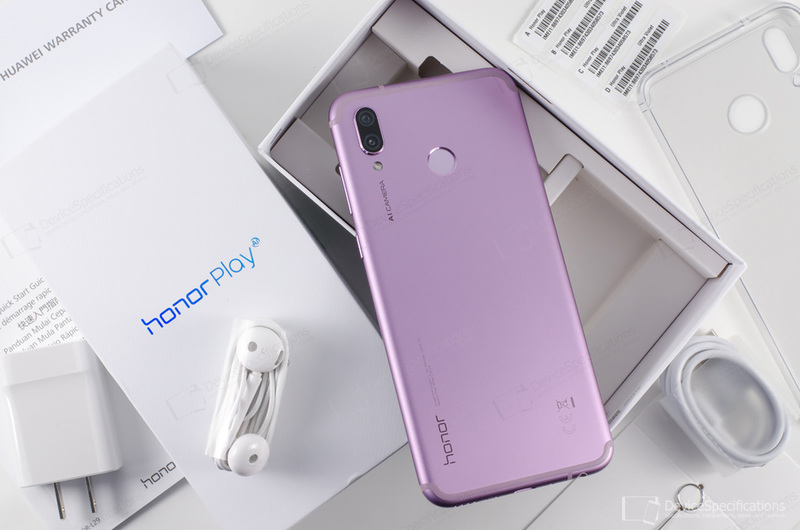 Honor Play (荣耀Play) (COR-AL00, COR-L29, COR-TL10) is the first Huawei smartphone to carry on board the in-house developed GPU Turbo technology. Conceived as a gaming smartphone under the clad of a classic mobile, this handset ticks all the right boxes for users who are looking for a top performer that handles equally well everyday tasks and offers quality entertainment. And no one would be shy of showing it off as it is quite a looker! However, we are wary of two pain-points that might become deal breakers for some. The first is the 2MP auxiliary rear camera which is mediocre compared to the usual high-end auxiliary rear cameras of fellow models such as the Honor 10, for example, which is based on a Kirin 970 chipset as well. Actually, to us, it looks like Huawei has taken the Honor 9i/9n and has boosted it up with a larger display, larger battery and more powerful chipset, while the remainder of the features is stuck at classic mid-range. Secondly, the Kirin 970 chipset does tend to get very hot when it processes heavy graphics, hence the throttling and lower battery life. GPU Turbo promises better performance and better power efficiency, so it will be interesting to us to compare the Honor Play performance and battery life to those of the Honor V10. Without further ado, let's start with the specs and continue from there with our in-depth review of the Honor Play. Huawei Honor Play with model variants COR-AL00, COR-L29, COR-TL10, is built around a 6.3-inch IPS display with a resolution of 1080 x 2340 pixels, a typical brightness of 450 cd/m2 and 85% of the NTSC colour space reference coverage. The screen adorns an all-metal unibody with discrete antenna design and under the metal hood, a HiSilicon Kirin 970 chipset ticks. This 10nm SoC houses an octa-core CPU (4x 2.36GHz Cortex-A73 and 4x 1.86GHz Cortex-A53 cores) and a 12-core GPU (767MHz Mali-G72). They are complemented by an i7 coprocessor, a built-in NPU (neural-network processing unit) and GPU Turbo. The double-channel LPDDR4X RAM on board the Honor Play measures 4GB or 6GB and is clocked at 1833MHz. The built-in memory measures 62GB and can be expanded with up to 256GB. The AI capabilities of the chipset benefit mainly the cameras of the model. They include a 16MP main rear shooter with an f/2.2 lens and a 2MP auxiliary monochrome snapper with an f/2.4 lens. They are aided by phase-detection AF and a single-LED flash. The 16MP front-facing camera is paired with an f/2.0 lens and supports facial unlock. The handset arrives with a rear-mounted fingerprint sensor from Fingerprint Cards. Power is supplied by a 3750 mAh battery. It is coupled with a 5V/2A~9V/2A fast charger. Huawei Honor Play supports dual-band Wi-Fi 802.11ac with 2x2 MiMO, Wi-Fi Direct, Wi-Fi Hotspot, Bluetooth 4.2, dual-SIM 4G LTE and VoLTE, GPS, A-GPS, GLONASS, BeiDou. The COR-L29 version of the model supports NFC with Huawei Beam. 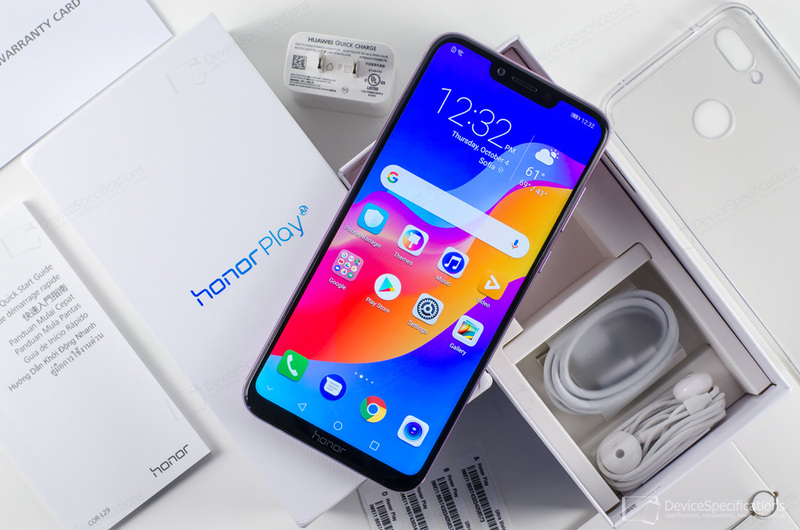 The list of supported network bands by the Honor Play includes 2G GSM (850, 900, 1800, 1900 MHz), 2.5G CDMA 800 MHz, 3G TD-SCDMA (1880-1920, 2010-2025 MHz), 3G UMTS (850, 900, 1900, 2100 MHz ), 4G LTE-FDD (850, 900, 1800, 2100 MHz), and 4G LTE-TDD (1900, 2300, 2500, 2600 MHz). The handset is equipped with a 3.5 mm jack, USB Type-C 2.0 port with OTG support, and a single, bottom-firing speaker. It runs on Android 8.1 Oreo with EMUI 8.2 on top. Complete Huawei Honor Play specifications.